It was a New Year with a difference. A New Year with the Celtic Saints. This was an opportunity to explore their world, learn about their robust view of faith and life, and walk where they walked. This was faith-building and fun. With some feasting thrown in. We gathered on the afternoon of Saturday 30th December 2017. 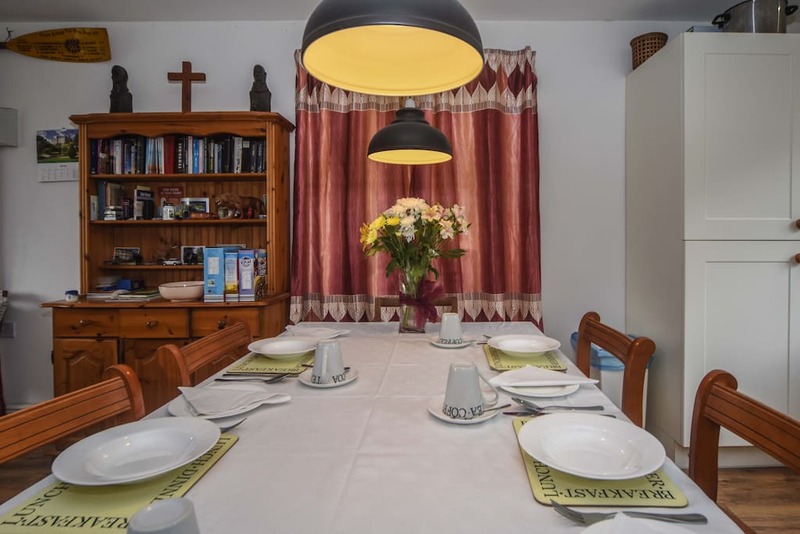 Naturally, this evening, as every evening at Grey Alders, we had a meal together, with time for fellowship and prayer afterwards. On Sunday 31st, after morning devotions and breakfast, we ventured into Pembrokeshire and visited St Govan’s Chapel which is concealed and almost on the beach. It is only approached down a flight of steps from St Govan’s Head. It is said Govan escaped from pirates when the rock opened up. He hid in the cleft and founded a church in thanks to the Almighty. The current structure dates from the middle ages. In the afternoon, we motored to St David’s to look around the cathedral close. We saw the stream the sixth-century evangelist stood in to pray. Dewi’s monastic order allowed fish once a week and no meat. They were a tough bunch, these Celtic Christians! There was an opportunity to stay for Evensong in the Cathedral, a service which goes back 500 years to the time of the Tudors and was itself based on services dating back to the time of the Celtic Saints. 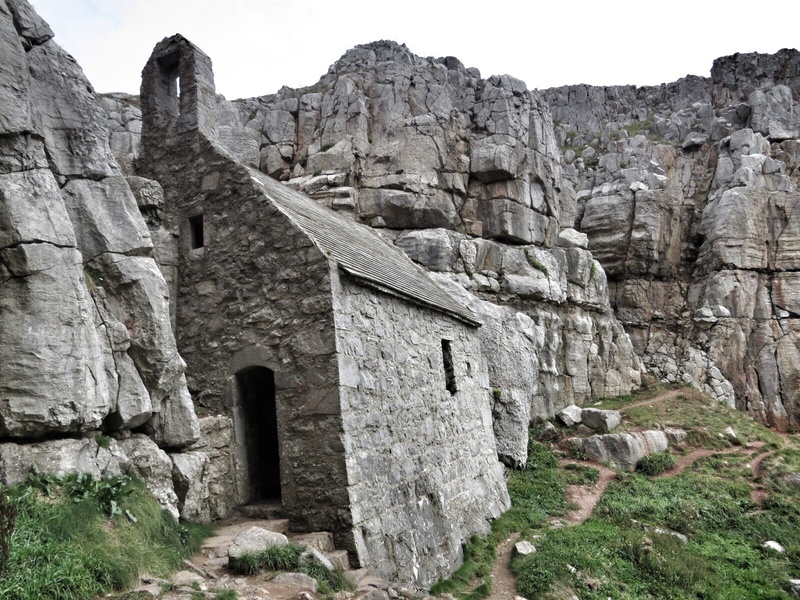 St Govan's Chapel dates from mediaeval times and is only accessible down a flight of stone steps. On Monday, after morning devotions and breakfast, we walked together on the very road travelled by our local Celtic saint Gwinio between his retreat at Cilsant and the site of his monastery at Llanwinio. 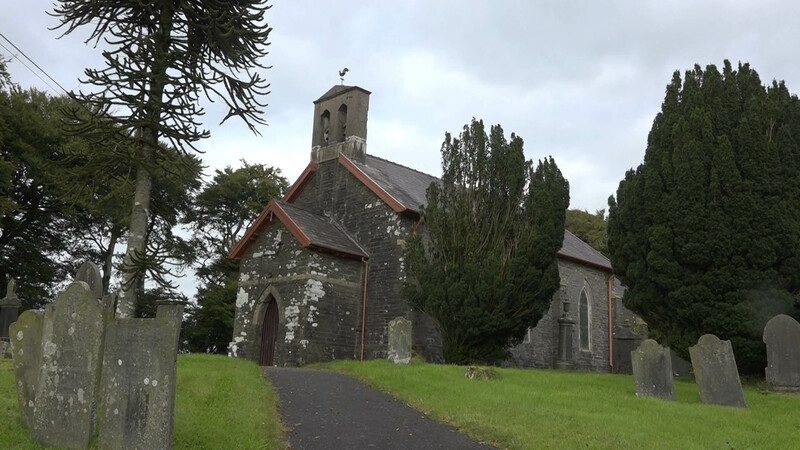 For three-and-a-half miles we followed lanes, went through woodland, along valleys and up to the hill to Llanwinio itself, walking in the actual steps of the man of God fifteen hundred years ago. We also saw the spot where he lost his life by neglecting the 6th century travellers’ rule – ‘always go together’. It is said a healing golden spring – living waters – sprang from the ground his severed head touched. On Tuesday 2nd once again served breakfast before the pilgrims departed for home. Naturally we hope and pray everyone left blessed by their time walking in the footsteps of the Celtic Saints.